– What does “being allies” look like? – What do deaf interpreters want to tell the deaf community? The hearing community? – What is in the crystal ball for the future? 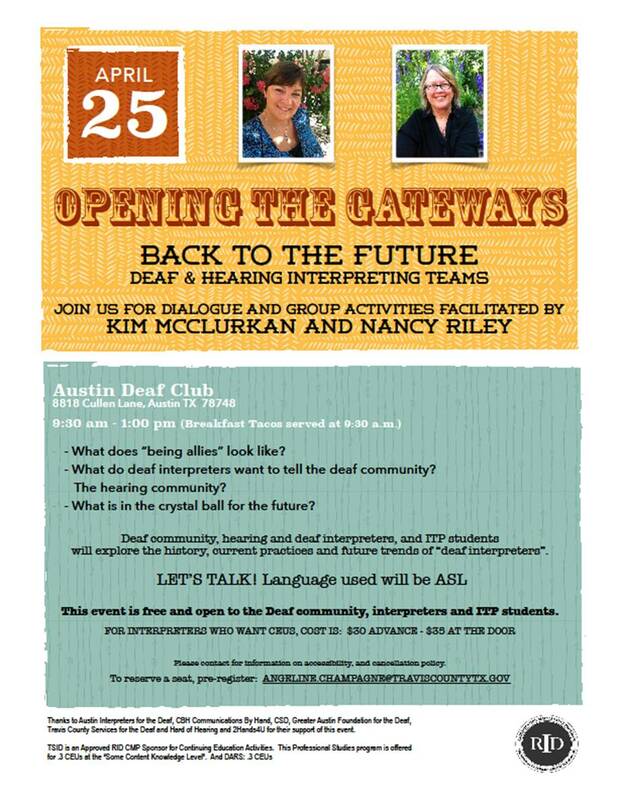 Deaf community, hearing and deaf interpreters, and ITP students will explore the history, current practices and future trends of “deaf interpreters”. LET’S TALK! The language used will be ASL. This event is free and open to the Deaf community, interpreters, and ITP students. For interpreters who want CEUS, cost is $30 advanced or $35 at the door. Please contact for information on accessibility and cancellation policy. Thanks to Austin Interpreters for the Deaf, C8H Communications By Hand, CSD, Greater Austin Foundation for the Deaf, Travis County Services for the Deaf and Hard of Hearing and 2Hands4U for their support of this event. TSID is an Approved RID CMP Sponsor for Continuing Education Activities. This professional study program is offered for. 3 CEUs at the “Some Content Knowledge Level”. And DARS: .3 CEUs.